Strategy of a "Feel Putter"
A big topic of conversation within the world of golf, and one which reaches all the way down into daily play at public courses like ours, is pace of play. Recently, I’ve read a number of opinions on one particular thing that many of the “experts” think is slowing down the game—using a line on the golf ball to line up each and every putt. If you have ever watched a PGA Tour event, you have probably noticed the absorbent amount of time some players take on the greens. Using the line on the ball as an aid is, in my opinion, just one part of what slows down this process, and although it is undeniably helpful to skilled players, I want to offer a modified version of this putting aid for those of us who aren’t planning on getting our PGA Tour card anytime soon. So firstly, if you have no idea what I’m talking about with this line, let me quickly and simply explain. 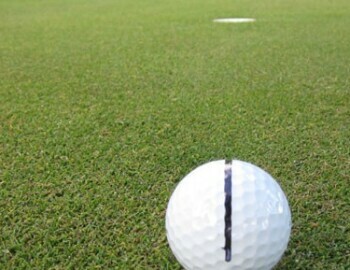 Basically, players use a straight line they have drawn on the ball (or use the one already imprinted on the ball by the manufacturer, depending on your preference of golf ball) as a visual aid and point that line towards where they think the putt needs to be directed. After they are done reading the putt, they will at times meticulously place, adjust, and replace the ball so the line is pointing at the exact spot they think the putt needs to be directed toward. If you adhere to the method of “Spot Putting” and have confidence that you can hit your putt in the exact direction of that line, this method is incredibly helpful. However, as I alluded to earlier, it can become cumbersome and time consuming to get the line in the exact spot you want. Instead of spending so much time making sure the line is pointing directly toward the spot or read I have decided on, I use the line to separate the area of the green between my ball and the hole into 2 halves. I point the line directly at the hole, regardless of my read, which for me simplifies the potential miss of a putt hit off of line. From that point, I use the line as a guide for my feel on how far left or right I need to hit the putt to get it on line. For example, if I read a putt as braking about 2 cups to the left, I will see my putt starting to the right of the line on my ball. I am a huge “feel player” and this method helps me to play to my strength of feeling the break and the line rather than turning my putting into a scientific, specific action. When I was teaching undergraduate golf classes at the University of Tennessee, I had a number of my students try this method with some success. I don’t think everyone needs to immediately go try it, because like I always tell people, golf is an individual sport—what works for me or you won’t necessarily be the best for another person. That said, if you’re struggling on the greens and are searching for something new, I would encourage you to give it a shot. Just think about striking your putt to go either to the left or right of the line, depending on your read, and try to get the feel for how far left or right of that line you need to hit it to match what you have read on the green.